Using Calxa Premier you may edit a KPI number format, create custom KPI formulas, create custom account groups and metrics and in some cases edit the accounts included in default account groups. Steps for running KPI reports and charts are outlined in the help note KPI Reporting. To edit KPI settings you must first click on the Edit KPIs button in the Calxa ribbon. KPI Formulas: - View formulas for existing KPIs or create new ones. Formulas are built from the Account Groups and Metrics and a selection of mathematical symbols. Note that the default KPIs include a simple IF statement to eliminate the possibility of problems dividing by zero. We recommend you follow a similar practice when creating your own formulas. Account Groups: - View existing Account Groups or create new ones to use in your KPI formulas. Groups help you simplify your formulas by consolidating related accounts. Metrics: - View existing Metrics to use in your KPI formulas. Metrics allow you to capture additional non-financial values like ‘number of hours’, which then enables you to calculate unit costs such as ‘cost per hour’. To view the properties of a KPI select it from the list on the left hand side. Name: - This name will be used to identify this KPI in lists and KPI reports. Notes: - For default KPIs provides a description of the KPI however may be used in custom KPIs for any notes. Number format: - This is the number format used for KPI results. Formula: - The formula used to calculate the KPI result. For default KPIs the Name, Notes and Formula fields cannot be edited however you may edit the Number format for any KPI. A KPI is essentially a formula built from mathematical symbols and then named Account Groups and Metrics which are defined in the Account Groups and Metrics section of the Edit KPIs screen. First ensure you have the appropriate Account Groups and Metrics available for the KPI formula you wish to create. Refer to the Account Group and Metrics sections for more details. In this example we will create new KPI called Cost per Customer which is calculated as Total Costs divided by Number of Customers. In the KPI Formulas section; click the button. A new KPI will be created with the default settings. Give your custom KPI a Name and click OK.
Add notes to your new KPI as appropriate. Set the Number format to the desired format. Edit the Formula to match the requirements of your new KPI. KPI formulas may use Numbers, Operators, Account Groups, Metrics, Functions and Constants. You may use the drop down Insert menu or type directly into the formula field to edit a formula. Refer to the Detailed KPI Formula Rules document attached at the end of this help note for a comprehensive list of available properties that may be used in KPI formulas. Note: In this example we have used an IF function to check if [Total Customers] is zero to eliminate the possibility of problems dividing by zero. We recommend you follow a similar practice when creating your own formulas. The ‘null’ value is returned when the KPI can’t be calculated and is displayed in reports as N/A. If this practice is not followed and a divide by zero error occurs the report cannot be generated. 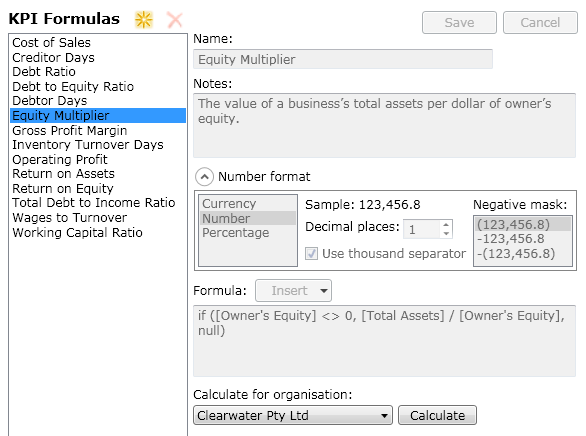 You may optionally use the calculate function to check your KPI formula and ensure it behaves as expected. Select your Organisation and click Calculate. 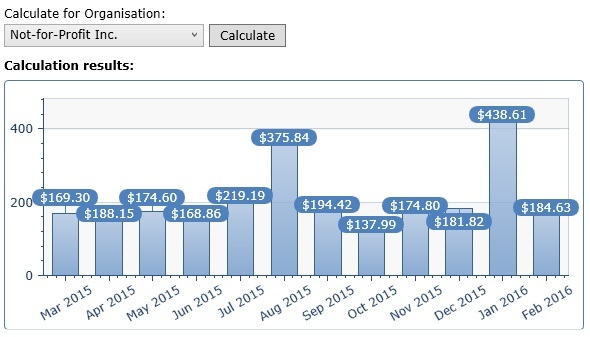 A bar graph and table will be displayed with the new KPI results for actuals in the previous 12 months. Account Groups are a named collection of accounts which are used to simplify KPI Formulas. To view the properties of an Account Group select it from the Account Groups list. Name: - This name will be used to identify this Account Group in KPI formulas. Account group type: - The type of group determines how the value of a group will be calculated. Period Movement: - calculated as the sum of movement in each account for the reported period. Annual Movement: - calculated as the sum of movement in each account for the 12 month period ending at the end of the reported period. Closing Balance: - calculated as the sum of the closing balance on each account where the closing date is the end of the reported period. Description: - A description of the group of accounts. Account Selection: - The selection of accounts included in the account group calculation. The default Account Groups Name, Account group type and Description may not be edited. The following default Account Groups may however have the Account Selection edited: Fixed Costs, Wages, Current Assets, Current Liabilities, Inventory and Owner’s Equity. This option is only available for the Wages, Current Assets, Current Liabilities, Inventory and Owner’s Equity Account Groups. Check the Edit checkbox in the Account Selection window. Select the account checkboxes of the accounts you wish to include in the Account Group and deselect the checkboxes of the accounts you wish to remove from the Account Group. When you are happy with the selection click the Save button in the upper right corner of the Account Groups section. In the Account Groups section; click the button. A new Account Group will be created with the default settings. Give your custom Account Group a Name and click OK.
Set the Account group type and Description as appropriate. 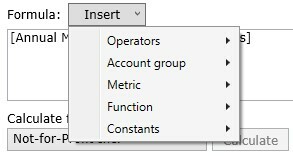 Note: Remember that the Account group type determines how the account group will be calculated. Select your organisation. You should repeat the following steps for all Organisations. Use the check boxes to select the desired accounts for your new group. When you are happy with the settings click the Save button in the upper right corner of the Account Groups section. Metrics are used as a way to store data that is not related to your financial accounts. These metrics can then be used in custom KPI Formulas as described above. To create new Metrics and edit their Actuals and Budgets please refer to the Help Note Article – Using Metrics. In the Edit KPI screen you can then configure the calculation mode for the Metric values. First select the Metrics Tab in the right hand side of the Edit KPI screen. Then set the Mode as required. Period Range: - Calculates the sum of all monthly values in the date range provided by the report criteria. Used where values saved in the metric are period movements and the report requires the full period movement. End Period: - Gets the value saved in the end period where the end period is determined by the end date in the report criteria. 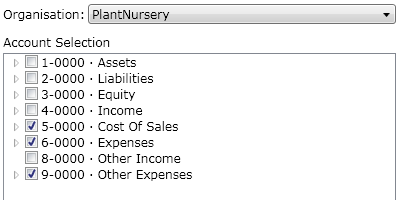 Used where values saved in the metric are already a closing balance.